The man suspected of brutally killing a family of three and their housekeeper in a northwest Washington, D.C., mansion last week was arrested late Thursday night in a traffic stop across town, capping a manhunt that had expanded to New York. Daron Dylon Wint, 34, who had once worked for the company run by one of the victims, is scheduled to make his first court appearance Friday afternoon. In a statement released through a spokesperson Friday, the Savopoulos family thanked the law enforcement agencies involved in Wint's arrest. "While it does not abate our pain, we hope that it begins to restore a sense of calm and security to our neighborhood and to our city," the statement read in part. News4's Jackie Bensen reports from Brooklyn, New York, where police have been questioning the girlfriend of the northwest D.C. quadruple homicide suspect for hours. Wint showed little emotion when he was captured, Robert Fernandez, commander of the U.S. Marshal Service's Capital Area Regional Fugitive Task Force told The Associated Press on Friday. "He was stoic," Fernandez said. Who Is Daron Dylon Wint? "We believe he saw himself on the news and just took off," Fernandez said. Investigators then tracked Wint to a Howard Johnson Express Inn in College Park, Maryland, on Thursday night, he said. A team realized Wint was probably in one of two vehicles in the motel parking lot: a car or a moving truck. The vehicles left together and the team followed as they took a U-turn and a strange route. A nationwide manhunt is underway with a focus in D.C. and New York for Daron Wint, a man suspected in a quadruple murder case inside an upscale D.C. home. "We thought they were either trying to throw off a trail or see if anyone was following them," Fernandez said. Fernandez says at one point, the team had about 20 undercover vehicles following Wint. His team then had to figure out how to stop both vehicles at once. "Stopping two vehicles at once with a pinning maneuver is difficult. We had never done it with two vehicles, and we had never done it with a box truck," Fernandez explained. 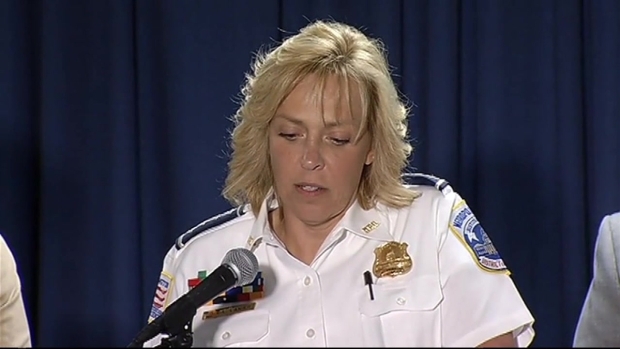 Officers eventually got between the two vehicles in 1000 block of Rhode Island Avenue NE at about 11 p.m. and took Wint into custody, along with several men and women, Fernandez said. The men and woman taken into custody along with Wint have not been formally charged or arrested. "We had overwhelming numbers and force," Fernandez said. "They completely submitted immediately." Fernandez said he noticed a big wad of cash in the moving truck, but he didn't know how much was there. NBC News has confirmed that at least $10,000 was found in the moving truck. 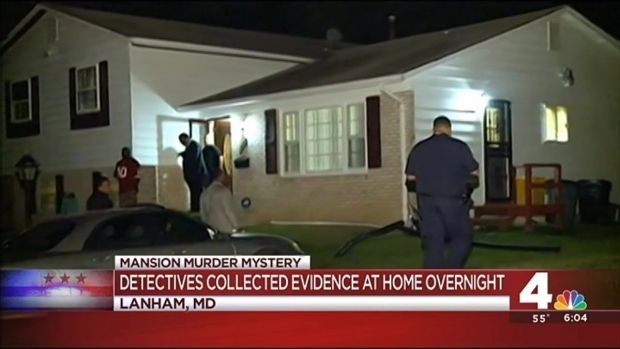 Police searched the Lanham, Maryland, home of D.C. quadruple homicide suspect Daron Wint's family Thursday. Meagan Fitzgerald reports. It was not clear whether that money might have been connected to the Savopoulos family. Fernandez said he did not know whether any weapons were found as the group was taken into custody. Wint is charged with first-degree murder while armed in the deaths of Savvas Savopoulos, 46; his wife, Amy Savopoulos, 47; their son, Philip; and housekeeper Veralicia "Vera" Figueroa, 57. 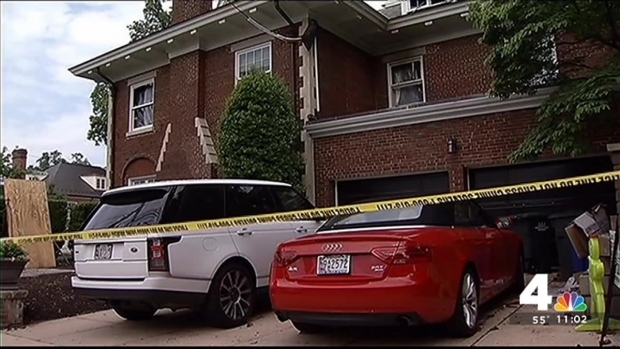 Their bodies were found in the Savopoulos family's burning mansion early in the afternoon of May 14. Authorities had searched several locations in Maryland for Wint on Wednesday night and Thursday. Law enforcement sources said Thursday afternoon they believed Wint took a bus to New York City and arrived in Brooklyn in the previous 24 hours, before returning to the D.C. area. A law enforcement official told NBC 4 New York's Jonathan Dienst that they tracked Wint to Brooklyn in part through his phone, which his girlfriend had when they interviewed her Thursday. 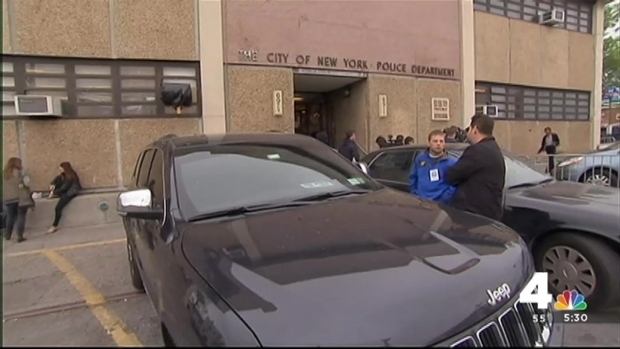 Wint's girlfriend, a Brooklyn resident, talked to NYPD officers at the 69th Precinct in Brooklyn for hours after being picked up at her apartment Thursday. She told police Wint was going back to D.C., possibly to surrender. She is not under arrest, NBC 4 New York reports. Marc Santia of WNBC is in Brooklyn, New York with an update on the possible travel of the man police say is a suspect in the quadruple homicide in a Northwest D.C. mansion. Police believe the victims were kept bound and threatened overnight the night before they were killed. Sometime that night, someone called Domino's from their house and ordered pizza. 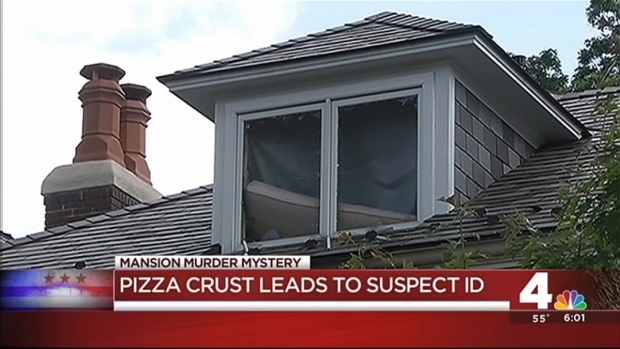 Sources say Wint's DNA was found on a pizza crust. The next morning, someone delivered $40,000 in cash to the multimillion-dollar house. The cash was withdrawn from an account at American Iron Works, where Savvas Savopoulos served as CEO. Sometime after the cash arrived, the home was set on fire, leading to the discovery of the bodies. Three of the victims had been beaten and stabbed to death, and some of the bodies smelled of gasoline, police said. Philip's body was so badly burned that investigators aren't sure if he was injured before the fire was set, and he still hasn't been officially identified, sources close to the investigation said. 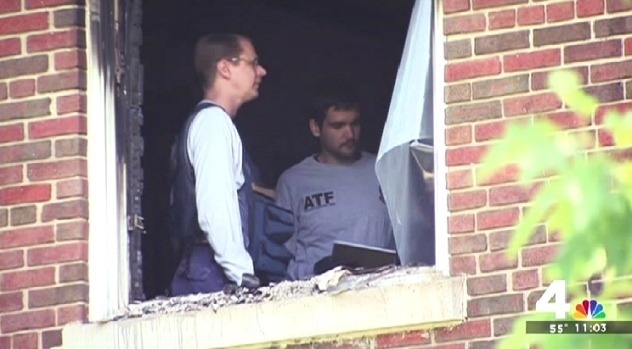 The man suspected in the deaths of four people at a D.C. mansion is connected to the slain family by his former workplace. Prince George's County Bureau Chief Tracee Wilkins talked to coworkers in Hyattsville about the suspect and his former boss. His body was found in his room; three other bodies were found on the floor in another bedroom. Later on the afternoon of May 14, the family's Porsche was found burning in a church parking lot in suburban Maryland. Police had circulated the grainy image of a person leaving the scene of the car fire, wearing black clothing. Police said Thursday that they haven't ruled out the possibility that other people were involved in the slayings, but no other suspects have been identified. From 2003 to 2005, Wint worked as a welder at American Iron Works, where victim Savvas Savopoulos served as CEO, sources said. One of Wint's relatives was also fired from the company. An American Iron Works welder -- who said he lost a great friend in Savopoulos -- told News4 that Wint couldn't get along with any of his coworkers when he worked there. Attorney Robin Ficker, who has represented Wint in the past, told News4 he doesn't believe Wint did it. "He is a gentle guy. He was a student at Prince George's Community College. He wouldn't hurt a fly," Ficker said. "He's the kind of guy that you wouldn't mind your grandmother going to lunch with." At least one police record lists a home address that is less than a half-mile from where the Porsche was found burning. Savopoulos and his wife, Amy, were well known in the neighborhood, often hosting parties for neighbors and friends, according to The Washington Post; the family attended St. Sophia Greek Orthodox Cathedral in the neighborhood. Philip was a fourth-grader at St. Albans, the private school near St. Sophia and the National Cathedral; two daughters were away at private boarding schools. News4's Pat Collins shares what police know -- and what they're still working to find out -- in the murders of three family members and their housekeeper at a Woodley Park mansion last week. Neighbors who have been in the home said the family had an extensive and valuable art collection, which was on display a couple of years ago during the Christmas house tour put on by St. Albans. The timeline of events that investigators are working from seems to match information from a longtime housekeeper for the Savopoulos family, who said she was a good friend of Veralicia Figueroa. Nelly, who didn't want her full name used for security reasons, owns her own cleaning company and worked for the family for more than two decades. Nelly allowed Figueroa to work with her at the Savopoulos family's home. On May 13, Figueroa texted Nelly to say she wanted to work at the home, and planned to finish by 3 p.m., Nelly told News4. That evening, Nelly missed a call from Savvas Savopoulos, saying Figueroa was spending the night at the family's home. She heard the call on voice mail the next morning. 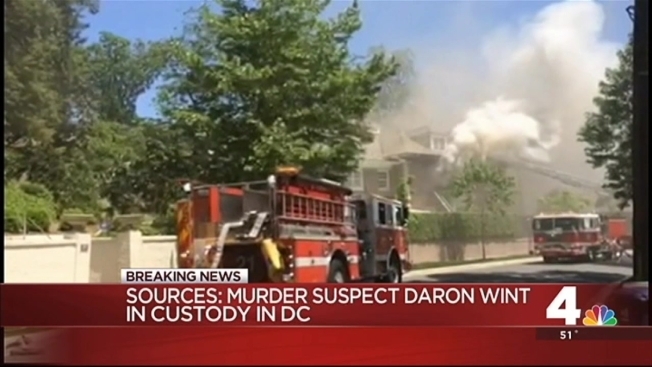 DNA found on a piece of a pizza led police to name Daron Dylon Wint, 34, as the man they believe brutally murdered a D.C. family and their housekeeper in Woodley Park last week. Nelly said Figueroa's husband went to the home the morning of May 14 to look for her and had an eerie encounter. No one answered the door when he knocked on it, but he told Nelly he had the feeling someone was standing just inside the closed door. He went around the back of the house to knock again. As he did, Nelly said, Savopoulos called his cell phone. 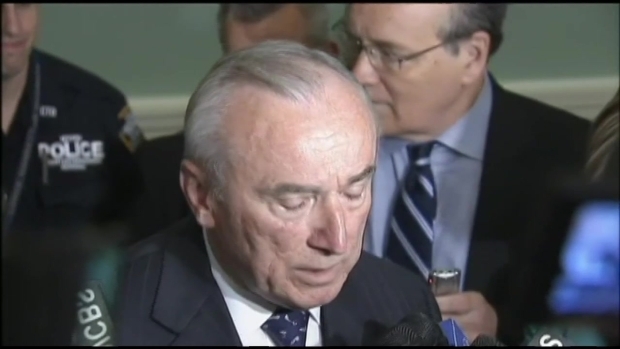 Savopoulos said Figueroa was OK and had spent the night, according to Nelly. The fire at the home was reported about four hours later. Police are looking for 34-year-old Daron Dylon Wint on a first-degree murder charge in the quadruple homicide in Woodley Park. Shomari Stone and Jackie Bensen report. A GoFundMe page has been created to help with her funeral costs. Throughout the week, federal agents and D.C. police have continued to gather evidence at the Woodley Park home. Meanwhile, in New Carrollton, authorities used a bloodhound to try to track down the person who torched a 2008 blue Porsche 911 stolen from the home on the day of the fire. The Porsche was found burning in the parking lot of St. Christopher's Episcopal Church. At a banquet hall nearby, surveillance video of a person of interest in the case was captured on a security camera. Police say Wint is the person of interest seen in the video. While he is difficult to see, police say Wint was dressed in dark clothing, including a hoodie with the hood pulled up. Meanwhile, neighbors and friends are mourning the family -- and left dreading the idea of what they endured in the hours they may have been held captive in their own home. "This was a beautiful family, a wonderful family with children," said Coco Palomeque, a friend of Amy's. She described Amy as "beautiful, vibrant, full of life and full of energy -- ready to jump into any project to help others, to help her community." "The community where they lived really loves them, and we are here to support them if they need us," she said. Staff members Pat Collins, Meagan Fitzgerald, Mark Segraves, Jackie Bensen and Shomari Stone and the Associated Press are among those who contributed to this report.